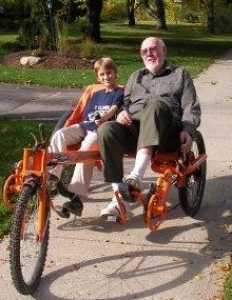 A folding recumbent is the latest in the “now anyone can ride” category. And, two people can ride side by side in comfort. It's much easier to have a conversation when you are riding side by side as opposed to a tandem bike where you almost have to shout to be heard. The riders can even pedal in separate gears and speeds. So riders of different sizes and abilities can ride together. If they feel like pedaling they can, or, with the optional BionX motor, they can just sit back and let the bike do the work. Another really great option is to just let the motor do the hard work on hills. It even has three wheels so balance is not an issue. The Ricksycle is stable, easy to ride (no special training required) and can be folded up into a compact size for storage or shipping. With 14 Speeds, it works great for both the casual cyclist and those looking for a little more adventure. Extended adult pedal units available for taller people. Three wheels mean complete stability. Independent pedal sets allow for separate pedaling speeds, gears and rest periods. Side-by-side seating makes conversation easy. Plus, a place to sit when you get where you're going.Either Rider can Steer. An unusual looking set of cranks allows the riders to pedal with nothing between their legs. BionX PL-250 ELECTRIC ASSIST HUB BionX launched a new and more efficient battery : the Lithium-Mn . Weighing only 2.8 kg, this new battery will provide 16% longer autonomy. In addition to possessing all the P-250 advantages, this model will appeal to cyclists who are looking for longer rides and for whom weight is crucial. An outstanding technological step intended for those who really love to ride. And, of course, it's eco-friendly. This electric recumbent is about as unique as it gets and can be customized to the nth degree.